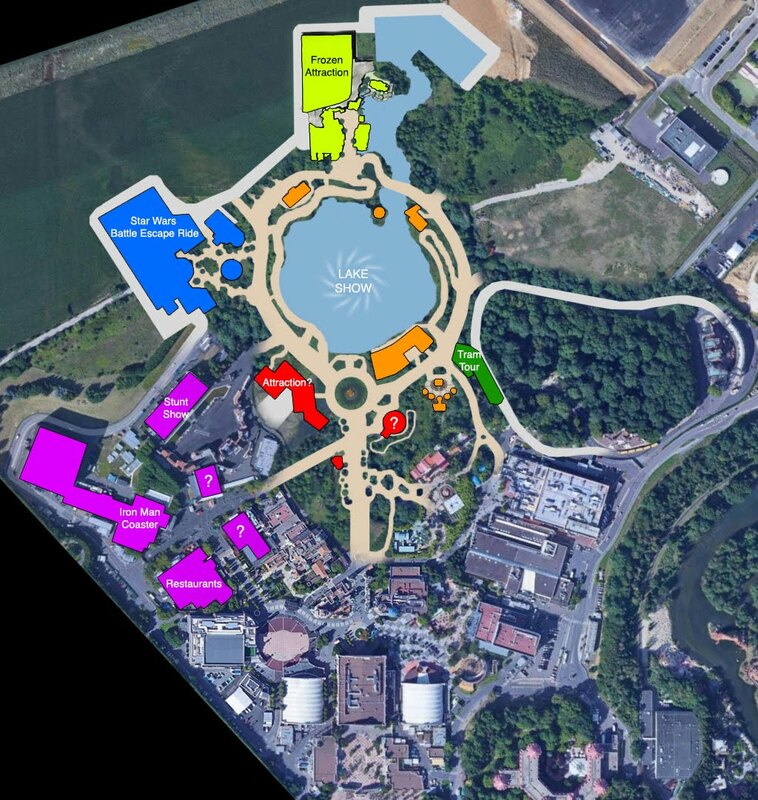 What is supposed to be the latest approved master plan for DLP Walt Disney Studios expansion has been leaked and posted on Disney Central Plaza forum by someone named Andrew Ryan. Apparently it's not a fake and it's the real thing so we'll have a closer look at it. 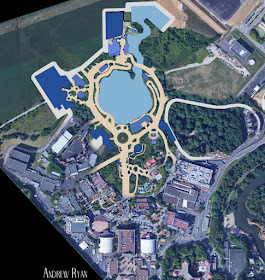 The one posted on DCP by Andrew Ryan is the one above but note that it is not the original DLPI master plan but one identical that Andrew Ryan did after seeing the original master plan. An article posted yesterday added some colors to see a bit more clearly what is what, it's the version below, to which i've added some text. and in Green color it's the Studio Tram Tour as, against all expectations, it seems they will keep the Tram Tour, at least for a while. In Red color it's others unknown attractions, out of the main three new lands, and in Orange color it's restaurants located near the central lake. Let's start by the Marvel land as, big surprise, the Armageddon attraction building which was expected to be the first one to be removed for a new attraction is still there. 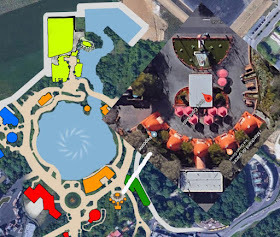 May be the attraction itself will be removed from the building but the building is still on the master plan and, as it's not a big show building, it could mean that they don't plan to put instead a new ride here, at least in the first phase of the expansion. A Marvel super-heroes meet and greet was rumored to open there so may be that's what will come inside the show building. Always in the Marvel land the Stunt show structure is still on the plan, but that one it's normal as they never planned to remove it now, only to change the stunt show theme to be replaced by a Marvel theme in a near future, may be when the land will be completed in 2021. The restaurants of the former Backlot will be rethemed, but this we knew it already. Apparently the completion of the Marvel land is scheduled for 2020 / 2021. Now, more about the lake: on the rendering below the lake seems to have a quite oval shape - though the perspective view of the artwork may be tricky - and now, as you can see on the plan, its shape looks more like a circle. 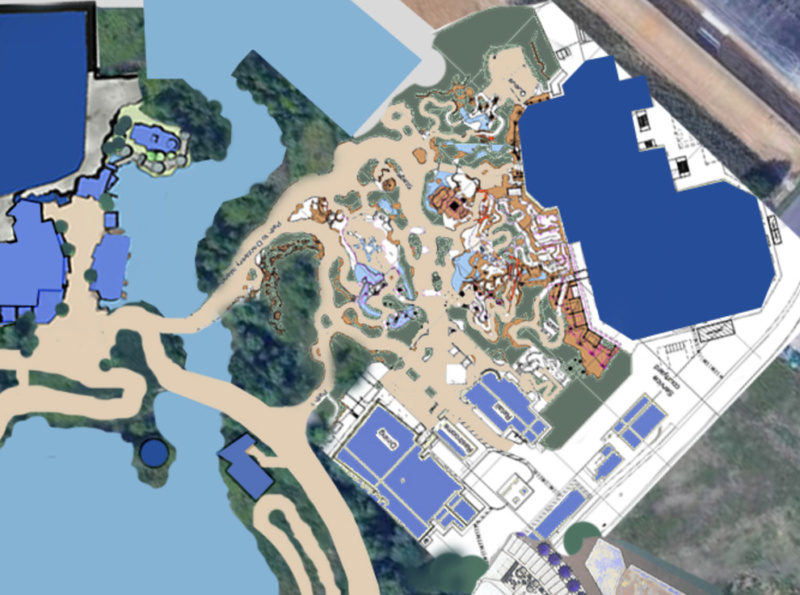 If the lake size has changed there is some reasons for that which would be too long to explain here, let's just say that it's probably not for budget reasons or the park blueprint itself. Around the lake the buildings color orange will be restaurants. 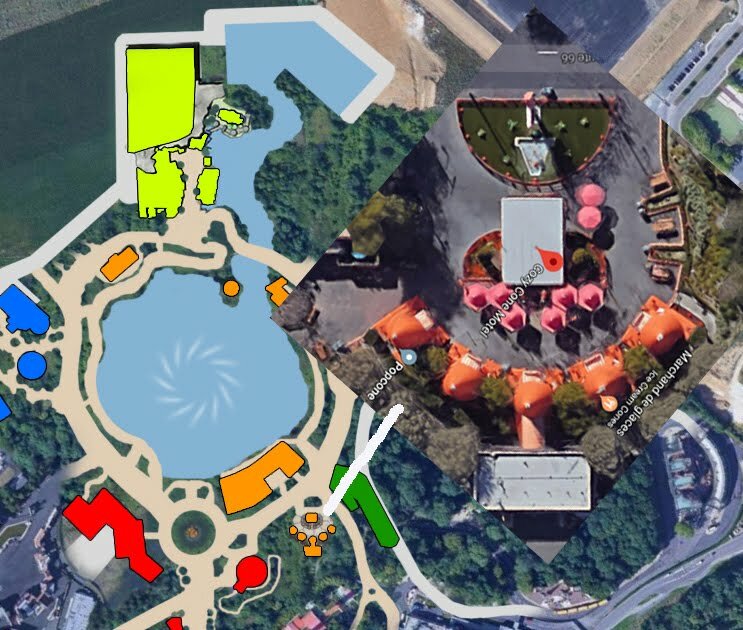 We can also see that paths will be created around the lake, most probably for guests who will stand around the lake to watch the show. I wouldn't be surprised if the paths will be built at different levels like they did at DCA Paradise Park for those watching World of Color, as it help to have different rows at different levels to don't have guests in the front row blocking the view for those behind. Talking about the lake, someone has checked and apparently it seems that the lake will be as big as the central one of Tokyo DisneySea's Mediterranean Harbor in front of the Hotel Mira Costa, where is happening daily the water parade. The lake of DisneySea looks bigger to me, though, so we'll see. 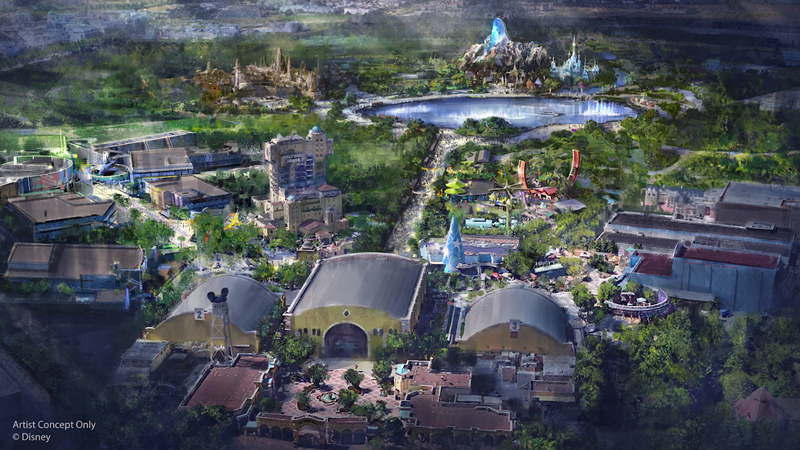 You'll also notice on the plan a water area outside the lake, on the right of the Frozen land. As it looks like a similar one at TDS - from where TDS floating floats are coming from - some wonder if the same kind of floating parade is envisioned for DLP WDS, with the floating floats hiding in this area until it's parade time. Could be the case indeed, but they've also planned a spectacular nighttime fountain show on the lake, meaning that all the fountain equipment will be located underwater and i'm not sure that the floats can move over it... we'll see, may they can if the fountain equipment can retract deeply enough inside the lake once the nighttime show is over. 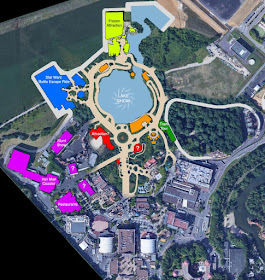 Let's move to Star Wars land on the left of the lake where the biggest show building is the one for the E-Ticket attraction and its shape looks exactly like the show building of the "Battle Escape" ride currently being built at DL and WDW DHS. So there is no doubt that this ride will come too at WDS SWL ...though i've been told that the ride could have some differences. No show building for the Millenium Falcon ride can be seen on the plan, meaning that the attraction won't be there in the phase one, may be in the future when the budget for it will be approved or if the ride capacity per hour is not a problem when it will open in the U.S. That said, the Star Wars land as it looks right now on the plan is obviously a smaller one, we'll see if it'll be the case when the land will open when it is scheduled in 2024, year of the Olympic Games in Paris. Nearby, WDS guests will find the Frozen land with one e-Ticket ride in the big show building that you can see on the master plan, but so far no sleighs roller coaster like the one being added to HKDL Frozen land is indicated, meaning that here, too, the land may have only one e-Ticket ride when it will open in 2022 or 2023. As i've said they apparently intend to keep the Tram Tour, with a shorter track though, may be because Catastrophe Canyon is so popular, and it helps to keep an attraction. Fans have noticed something interesting on the left of what is supposed to be the Tram Tour station, where you can see small orange spots. It looks like the Cozy Cone Motel at Cars land and if you look at a satellite view of it, the orange spots looks very much like the Cozy Cone Motel . On the picture below i've placed on the same angle a satellite view of the Cozy Cone Motel at DCA Cars Land so you'll see what i mean. As you can see on the master plan there is clearly room for future expansion on the right of the lake, and because the supposed Cozy Cone Motel is so intriguing - why would they put it here when there is no Cars Land nearby? 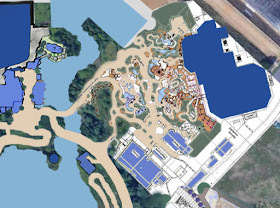 - some wonder if it means that DLP plan to build a Cars Land in the future. So, Andrew Ryan did another plan, this one not from an official DLP plan, in which he shows how could be include a Cars Land on the right. Not sure that the scale is 100% right, though, but even if it was 50% bigger, it could fit. The other long time rumored land for the WDS is the hugely popular Pandora land. I'll be happy to have Pandora at the WDS and here the issue might not be the painting but Pandora's extraterrestrial vegetation as DLP weather is not really tropical like in Florida. But Disney apparently is waiting to see if the Avatar sequels will be a success before bringing Pandora in others Disney parks, so we'll have to wait for this one. 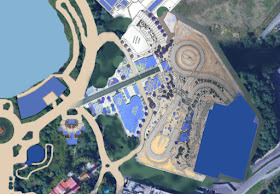 It didn't stopped Andrew Ryan to do another map showing how a Pandora land could also fit on the right of the lake, and this, even with a Cars Land under it. If the scale is right, apparently there is room enough to build both lands. That said, when we look at the expansion plan as it is right now, clearly the 2 Billion budget announced for DLP and WDS expansion won't be spent entirely in the WDS expansion ...which is in fact rather a good news as it means that they've kept a big part of the $2B budget for others additions ay DLP Magic Kingdom, a park which also desperately need new attractions. An announcement about this should come probably next year, so we'll talk again about it at that time. It the Cozy Cone rumour turns out to be true, the 'carousel' in the nearby might be in fact Cars rally moved there. It would make sense, it would create a small Cars land while the bigger one (as the one at DCA) is being considered. I think that the Tram Tour will be overhauled by an Cars theme, thats why the new entrance is on the same place. Something will bebe announced for the right of the park. Its way too barren to leave the cozy cone thing is definitely a hint at something and leaving the tram tour as it is just a distraction as to what they are really planning. I get this map is unofficial & made by memory. But if you use the size of Studio 1 to estimate the size of the lake, it makes for quite a small lake. TDS lake would be 2/3 times bigger IMHO. Also, with the newly announced ZOOTOPIA coming to Shanghai Disneyland in the future, this is another possible IP expansion that WDS could benefit getting.